Yes, that's right. 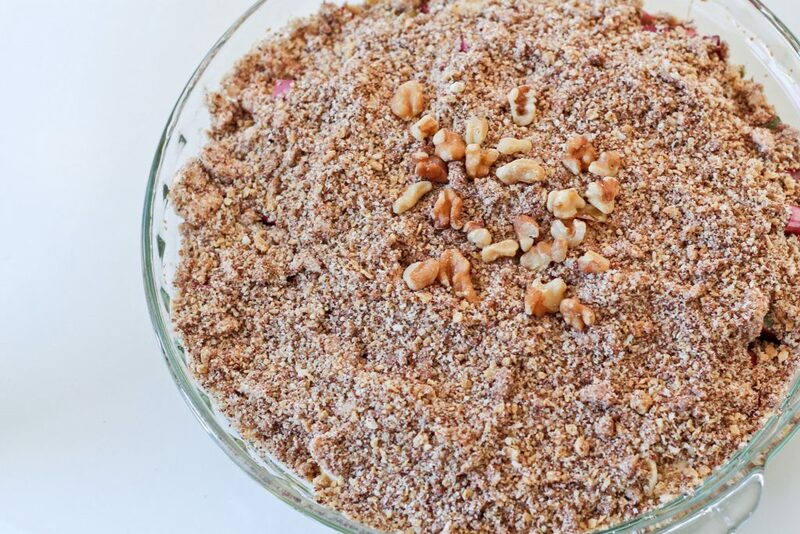 Paleo rhubarb banana crisp. I have a friend who is a wiz in the kitchen; really she is just all around handy. For example: she has created an urban rooftop garden made from reclaimed items- industrial containers and pallets. Amazing. She had me over for dinner last weekend and served a BBQ version of this. That's right, not only did she pull out a winning and unique crisp combination, she cooked it over a fire like a cavewoman. I used a boring old oven. Who is Paleo now? I guess I am, as I converted her winning combination into a grain free version. Kimbers' Killer Krisp (A.K.A rhubarb banana crisp). I am really excited to hopefully have some free time in the coming weeks, this double full-time job stuff is garbage. Especially because I want to spend my time cooking for you. And I should do some laundry before the pile starts talking and commanding me around like the talking garbage heap, from Fraggle Rock! I don't know I could stand the singing. Our upcoming recipe plans are so exciting! Raj has put together some incredible graphics! We are spending a week Greek! Actually 2 weeks. Make sure you don't miss out. Also, remember this Sunday is Father's Day– don't miss out on calling your old man! I will, but mostly for my benefit, as he is always entertaining. My father (both my parents) are very funny. Dry wit and sarcasm run thru my veins. As a teenager, I backed my car into the house. Yes, I did that. Luckily it was a low-speed crash and more damage was done to the paint on my bumper than the house. I sheepishly walked upstairs and Pops just looked at me. Really valid question, the house was big enough I should have been able to hit it every time. Thanks, Dad. You are the best. I still have a couple hours work to do here, but I can do it in my PJ's, while eating Paleo rhubarb banana crisp, with vanilla coconut ice cream. Try it. Bet you'll like it. 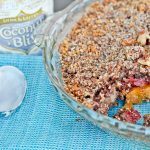 Paleo rhubarb banana crisp: The perfect mix of sweet and tart in a grain free dessert. Served with coconut ice cream a treat everyone can enjoy! Lay banana and rhubarb in the bottom of an oven-safe dish. Combine salt, almond meal, pecans, maple flakes, cinnamon, and nutmeg. Add grated butter, or slowly pour in coconut oil while stirring. Spoon over top of the banana and rhubarb until evenly covered. Allow to cool slightly (so it doesn't melt your ice cream too fast) before serving. He was so proud of himself. Bought a large foldable cooler about 5 years ago. OK 7ish? He found it and actually opened and USED it last week. Our groceries came home chilled, not half baked as usual. Not sure if he realizes yet that his #1 excuse just bit it. So then we come home from the Farmer’s market ..melt some cheese over nacho chips and waddle off for a nap. What else do you really need to do Saturdays? In the fascinating info for today Dept, Check out this TED. I made the rhubarb banana crisp for guests this weekend. I think I would add seasonal fruit (strawberries, raspberries, etc.) the next time I make it. We all really enjoyed it and I even bought some ice cream to have with it. Yummy! Have you tried any of the store-bought coconut ice creams yet? They are pretty darn good! I’m pretty sure the rhubarb was out of somebody’s garden. Is yours ready yet? Any fresh seasonal fruit combinations would be fun. I was just surprised at how great the rhubarb-banana combination was! Can you get the coconut ice cream at Save-on? Sounds good. We have had rhubarb for quite awhile now. It is one of the first things to be ready in our garden, even though we don’t use as much as we did before one of our docs told Dad it can cause kidney stones. The banana did add a different flavour to the crisp. I don’t think of banana in crisp form, but that just shows we should try different foods in different ways! I haven’t seen it in Save-on, I have purchased it from Safeway and natures fare, I’ll try to notice for you, or you could make your own, maybe we should post a recipe! I know where you are coming from with the banana in the crisp, I never would have thought of it either, but it seems to work! A recipe would be great!!!! What do you recommend as a substitute for maple flakes? Thanks! Palm or date sugar would also work. Or finely diced, dried dates. I ended up using coconut palm sugar because I was in a rush and couldn’t find the other options. It wasn’t as “crisp” as I was hoping, the batter was a little runny. But it still tasted delicious!! hmnnn…too bad it was runny. I’m glad it tasted good! omg. thank you sooo much for sharing this recipe! this was literally one of the best things I have ever tasted!! ohhh… Good improvising Jules! I was amazed at how well rhubarb and banana tasted too… Wish I could take credit for that genius!! Is there a typo in the amount of butter/coconut oil (1 cup)? Since someone mentioned theirs turned out runny, but the picture shows a “crisp” topping, I only put in 1/4 cup cold butter. I used a pastry cutter to cut it in to the dry ingredients. Hmnn… Honestly Val it has been a while since I have made the crisp, I do remember using quite a lot of butter, but if you got away with using less, that is always good!